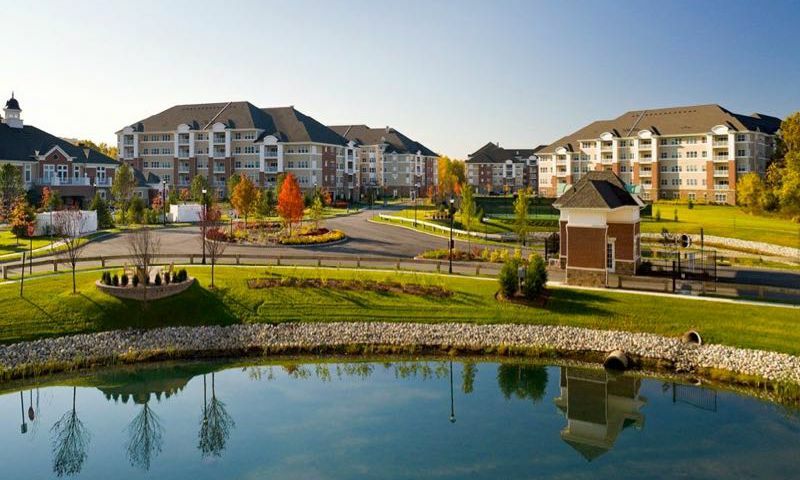 Wanaque Reserve is a scenic Del Webb active adult community that is located only 35 miles north of New York City in scenic Passaic County, New Jersey. This beautiful, amenity-rich community is age-restricted and welcomes residents aged 55 or better. At Wanaque Reserve, residents enjoy low-maintenance living in attached mid-rise condos. Each of these beautifully appointed buildings contain 74 individual homes, with secure, homeowner-only access and intercom systems to announce visitors. In addition to its prime location and thoughtfully designed condominiums, Wanaque Reserve offers the amenities residents expect in a Del Webb active adult community. The 20,000 square-foot clubhouse includes a wide variety of amenities and activities, such as hobby and game rooms, a computer center, entertainment hall, and both indoor and outdoor swimming pools. The local area includes many shopping, dining and cultural attractions, as well as excellent healthcare and close proximity to Newark International Airport. As in any Del Webb active adult community, Wanaque Reserve is flush with activities to support an active lifestyle. The impressive 20,000 square-foot clubhouse boasts state-of-the-art fitness facilities, which include both cardiovascular and strength-training equipment, and a heated indoor swimming pool. The spacious clubhouse at Del Webb's Wanaque Reserve also contains many hobby and game rooms, as well as plenty of space for community events. Residents can meet for a game in the card and billiards room, make use of the technology in the computer center, or express their creativity in the arts and crafts studio. There is an on-site theater room where residents can view and discuss movies, and a sauna. The large ballroom is the perfect entertainment hall for a wide variety of community events and parties. The outdoor resort-style swimming pool includes a surrounding deck for lounging in the sun. Residents can also stay in shape with a game at the community's tennis facilities or bocce ball courts, or by utilizing Wanaque Reserve s extensive walking and hiking trails. With all that this Del Webb community has to offer, it s no wonder that Wanaque Reserve has become such a hot property among active adults. The condominiums at Wanaque Reserve are available in three different floor plans: the Colfax, the Ryerson, and the Westbrook. Each of these homes is designed with two bedrooms and two bathrooms. One indoor garage parking spot is included with each unit, and there are additional exterior parking spots as well. Residents can also enjoy homes with their own private covered balconies. Del Webb's Wanaque Reserve offers resort-style living in a scenic community that is only 35 miles from the bustling city of Manhattan. With more than 40 social clubs, Wanaque Reserve makes it easy for residents to stay involved with the community and connect with their neighbors. Regular events, like movie night and poolside happy hour, give residents many options to fill their social calendars. Other popular clubs and activities include writers club, canasta, singles club, knitting, political action club, book club and much more. A full-time activities director is on hand to help manage the wide variety of clubs, plan community events and excursions, and generally help residents get the most out of life at Wanaque Reserve. Residents pay a reasonable monthly homeowners' association fee that covers lawn care, landscaping, snow removal, garbage removal, access to amenities and a gatehouse. This allows residents to enjoy life to the fullest and pursue their favorite hobbies. Wanaque Reserve by Del Webb is located just 35 miles northwest of New York City in the New Jersey highlands. This beautiful area contains many of Wanaque's neighboring cities, including Ringwood, Oakland, Ramsey, Ridgewood and Wayne. Convenient access to I-287 makes it easy for Wanaque Reserve residents to explore the surrounding Newark/New York metropolitan area. Being on the outskirts of New York City, residents have many opportunities to travel into the city for shopping, dining, theatre, or other cultural attractions. Just outside the community, Wanaque Reserve residents can enjoy several public golf courses, shopping centers and local restaurants. Yet residents also welcome the convenience of having extensive on-site activities. Excellent healthcare is available near Wanaque Reserve at medical facilities including St. Joseph's Hospital in Wayne, Chilton Memorial Hospital in Pompton Plains and Valley Hospital in Ridgewood. Transportation is also readily available at nearby Newark International Airport, which is handy for residents who frequently travel or have out-of-town guests. Wanaque Reserve is an ideal active adult community in Northern New Jersey with a convenient location, top-notch amenities, and well-built homes. The Lodge - 20,000 Sq. Ft. There are plenty of activities available in Wanaque Reserve. Here is a sample of some of the clubs, activities and classes offered here. Homes in Wanaque Reserve are arranged in ten five-story buildings that range from 1,768 to 2,119 square feet. Residences typically feature two bedrooms, two bathrooms, and a one-car garage. Fabulous apartments 1768 sq.ft. for the smallest unit. Split BRs,formal diningroom, library, laundry room, eat in kitchen. Great closets three in master BR. Great staff and things to do 7 days a week. Age of residents is a bit old. We need more 50 to 60s people. Many singles. Excellent activities, free movies, cafe which delivers food to your apt. Massage therapist on staff. Country club living with affordable maintenance. The bus to NYC is right outside the gate. Wanaque Reserve is great for convenience. The location is fantastic and condo living is the only thing I know. I've always lived in a no-maintenance type of property so for this stage of my life, being retired now, I wanted something easy to take care of but with all the perks. It's great having the fitness center and the pool so close to home and the social activities keep everyone here very involved with the community. It's a very nice place to live. 55places.com is not affiliated with the developer(s) or homeowners association of Wanaque Reserve. The information you submit is distributed to a 55places.com Partner Agent, who is a licensed real estate agent. The information regarding Wanaque Reserve has not been verified or approved by the developer or homeowners association. Please verify all information prior to purchasing. 55places.com is not responsible for any errors regarding the information displayed on this website.